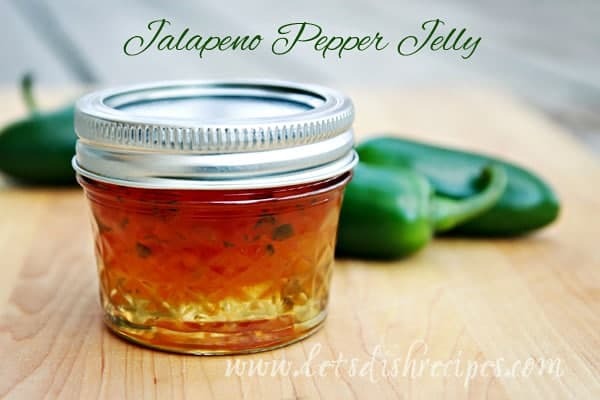 This Jalapeno Pepper Jelly is one of the easiest canning recipes I have in my collection. 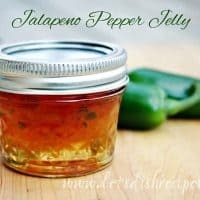 I don’t have any special canning equipment (or skills), so if I can make it, so can you! I just simmer the sealed jars in the biggest pot I have, and this recipe hasn’t failed me yet! It’s always a good idea to wear gloves when chopping jalapenos. If you use a food processor, I recommend draining the excess liquid from the peppers before adding them to the jelly. This stuff is great on chicken, sandwiches, crackers with cream cheese, or right off the spoon! The colors also make it great for Christmas gift giving. This makes enough jelly for about six (8 ounce) jars. Remove the stems and most of the seeds from the bell and jalapeno peppers. Mince peppers in a food processor or chop finely by hand. In a large pot over high heat, combine the bell peppers, jalapenos, sugar and vinegar. Bring to a boil and continue boiling for 3 minutes. Remove pepper mixture from heat and cool for 5 minutes. Stirring constantly, add the pectin and let mixture continue to cool for 2 minutes more. Stir for 1 additional minute. Pour pepper mixture into hot, sterilized jars and top with sterilized lids and bands. Place sealed jars in a simmering water bath for about 15 minutes. Remove from water and allow to cool slowly, creating a vacuum seal. Makes six 8 ounce jars. I like the sound of this dish -could be an interesting taste and texture sensation.